This page as PDF document for download (18 pages, 677 kB). This is the complete hardware. The ATmega8 is clocked with a 2.048 MHz xtal. With small changes of the software, xtals with 2.0 or 8.0 MHz can also be used. Power supply is with four 1.2 V rechargeable batteries so that standard LCDs with 5 V operating voltage can be used. The four-by-twenty LCD is connected to an 8 bit bus and three control pins at the ATmega8 (including Read/Write). By default the LCD is controlled in busy flag mode, but switching to wait mode is possible with a slight change of the source code. One key clears the stopwatch, one key starts and stops the watch and four keys (or low-active sensors) stop the four channels. The ISP interface allows programming of the controller within the running system. after having stopped two of the four channels. The millisecond clock is derived from the Xtal frequency as follows. When using a 2.0 or 8.0 MHz Xtal the 8 bit timer TC2 generates the ms clock via CTC mode and Compare Match A interrupt. If the default 2.048 MHz Xtal is used, this timer runs in free running mode and generates the 1 ms with the overflow interrupt. At 2.0 and 2.048 MHz the 8 bit timer TC2 works with a prescaler of 8, if a 8.0 MHz Xtal is used the prescaler is at 64. The Interrupt Service Routine of TC2, either triggered by the TC2OVF or by the TC2CMP vector, first reads in the current state of the keys. Handling of the keys is done outside the ISR, triggered by the bmS flag. Then the bRun flag is checked if the time measurement is on. If yes the millisecond counter is increased. If that counter reaches 100, it is resetted and the bdS flag is set. Further time counting is done outside the ISR. With the millisecond flag set, all keys are checked and, if active, the different actions are taken. Firstly, the ms flag is cleared to enable her re-setting within the ISR's next cycle. all LCD lines display zero, and. further key processing is skipped. The Start/Stop key requires debouncing to avoid short pulses of the key. To do that a debouncer register called rTgl is set to a predefined number of counts. In case of an inactive Start/Stop key this register is counted down each millisecond. Only if that register is zero, an active pulse is accepted and the bRun flag is reversed. After each active pulse at the key input, be it succesful or not, restarts this counter with the constant cTgl. cTgl should be large enough to cover usual bouncing times of keys (several tens of microseconds). this time is displayed at the LCD line of that channel. If all four channels have been processed it is checked whether all four channels are stopped. If that is the case, the stop row list in SRAM is used to display a sorted list of channels with increasing times. The bdS flag signals that 100 microseconds are over and that the deciseconds (and, if necessary, the rest of the clock registers) need an update. The flag is cleared and the time is increased. 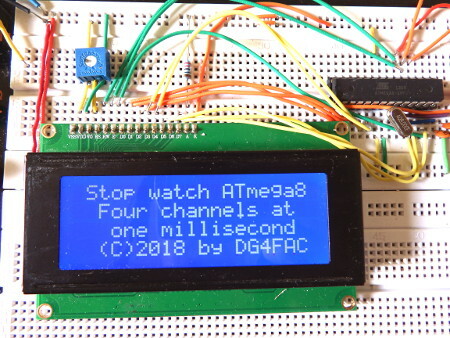 In all channels that not yet have been stopped (channel flag = 0), the current time is displayed (hours, minutes, seconds and deciseconds, but not the milliseconds). The tone generation is performed with the 16 bit timer TC1 in CTC mode and clocked with a prescaler of 8. At 2.0 MHz clock tones between 3.8 Hz and 250 kHz can be played, at 8.0 MHz clock between 15.3 Hz and 1 MHz are possible. Tone output is on output pin OC1A, which is toggled on compare match if tones are on and cleared if tones are off. This unloads the capacitor on the OC1A output so that no current can flow into the pin when the operating voltage drops. On each compare match an interrupt is triggered. The ISR counts down the 16 bit counter in R25:R24. If the counter reaches zero, the OC1A mode is changed to clear, switching tone output off in the next count cycle. Therefore R25:R24 controls the duration of the tones. The tone frequencies and the duration of the tones is defined in the constants cTonexxx (in Hz) and cTonexxxDur (in ms). From these constants the Compare values cCmpXXX for the TC1-CTC and the values cCtrXXX for the tone duration counter are calculated and listed in a table called ToneTable: (duration word first, compare value word second). The routine ToneStart: starts the tone, for which its number (0..10) is in register rmp. First the counter value is read and set, then the compare value. For the tones different octaves have been selected. During power-up and for the keys Reset and Start/Stop the fourth octave was selected, seconds/minutes/hours are one octave lower and the four channel keys are by two octaves lower. Other combinations and tones can be selected by changing the constants in the source code. LED control is done with the portpin PB2. During init the LED is permanently on. When time measurement is active the LED is blinking in tenth of seconds for the four active channels (counting channels are on), followed by an off-period of four tenth of seconds. When all four channels are stopped the LED is permanently off. If all four channels are stopped, the four times are displayed in a sorted list by minimum time. The row, in which the four channels were stopped, is stored in SRAM. The four times are either stored there. If during assembling the switch eep was set to 1 all twenty data bytes for times and the four row bytes are written to EEPROM. The EEPROM content can be read. The assembler source code for the stopwatch with an ATmega8 can be downloaded from here and viewed in the browser here. For assembling the LCD include file lcd.inc is required which provides all LCD routines. 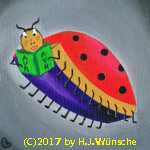 When programming the chip its fuses have to be changed to a medium-speed crystal (2.0 or 2.048 MHz) or a high-speed crystal (8.0 MHz), otherwise the measured times and the tones played are not correct.